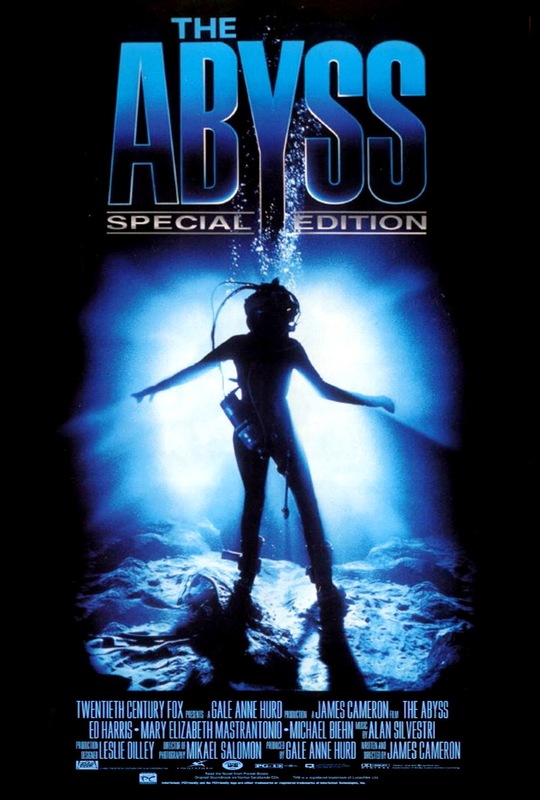 On my way through James Cameron's filmography a few months ago looking for new movies to watch I discovered The Abyss (1989) which Cameron did in between Aliens and T2. Bookended by some of the director's best early work and lead by the amazing Ed Harris I was intrigued, so when I found the movie for 4 bucks at Newbury Comics I couldn't resist. There's definitely a lot to like here: the acting from Harris is excellent as usual and his supporting cast comes off effectively as a tightly knit community. The cinematography is solid, conveying the claustrophobia of living in a confined space underwater (I absolutely love experiencing the interior of the rig the crew lives on). But the reason I say there's a lot to love here is there's just a lot of movie here, and sometimes that's not a good thing. In one way or another the movie borrows from almost every genre out there, although personally I wasn't as bothered by this as some of the critics. Perhaps more to the point, The Abyss is just a long movie. According to IMDb the theatrical cut clocks in at 139 minutes, but with the credits and everything it's actually 145, and then there's the Special Edition cut which ads another half an hour onto that already large figure. So let's talk about the differences between these two versions of the movie. 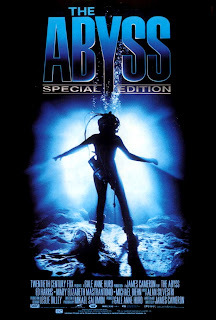 If you're going to watch The Abyss at all I recommend you make time for the longer cut. The funny thing about this movie is that there's definitely some excess fat in it but that's not what was cut for the theatrical version. Instead, they cut the good meaty bits and actually lost a fair chunk of the story's message. One scene curiously left untouched is the incredibly long and drawn out resuscitation scene. The thing is four minutes long, and while that might not sound like much it gets painful by the end of it. Maybe that's the point, and maybe there's supposed to be something there about Ed Harris's love for his wife, but it just didn't work for me. On the other end of things, the movie's finale involves an anti-war message from the aliens which is oddly eliminated from the theatrical version. Instead we just get an ambiguous note about Harris's relationship with his wife. 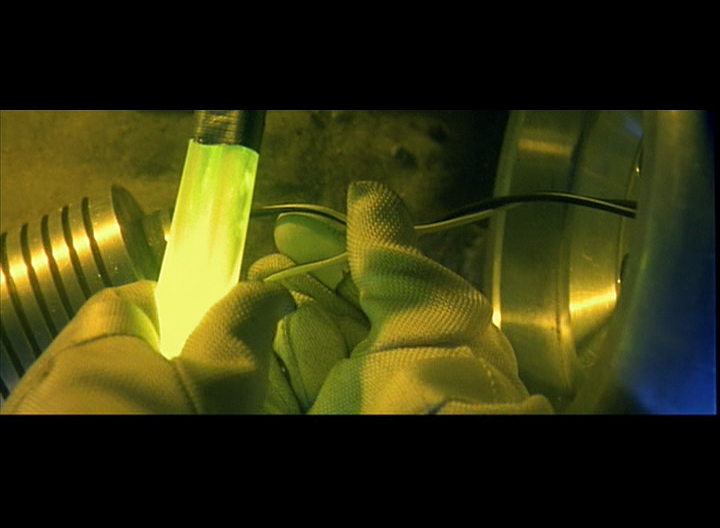 Including this scene gives more weight to the presence of the military in the film, and overall lends the film a more cohesive thematic structure. It might feel daunting to throw in a nearly three hour movie (especially one from an original screenplay), but trust me, the extra half hour is well worth your time. - For those of you who are curious, yes the liquid breathing suit thing Ed Harris wears is real. Harris did not actually breathe the fluid however (reference), instead holding his breath for all the underwater scenes. Also if you were worried about the rat, he was fine. That scene was cut for certain versions of the film due to perceived cruelty to animals, however (same reference as above). Sort of misses the point I think. - Michael Biehn basically plays the same role in this movie that he played in Aliens three years earlier except that, you know, in this movie he goes insane. He's kind of like a combination of Hicks and Hudson with a side of homicidal, anti-communist paranoia. Definitely a good mix. I consider this a great movie. It just feels huge. I recorded it off the TV when I was young, and later obtained the Directors Cut version on video. I wouldn't mind revisiting it on bluray. Maybe I will. The special effects are real impressive. Obviously the ending is preachy, but the aliens were different from the usual. I think when I saw the tsunamis, I thought anything was possible on film (and this was before 'Deep Impact's' massive tidal wave). They don't make movies like this anymore - though maybe they shouldn't because 'The Abyss' seems mostly forgotten. However, the resuscitation scene (and the lead-up) was tense as hell, and the descent to the bottom of the ocean is still highly original and compelling. Yeah I was definitely glad I found this movie since it doesn't seem to deserve its relative obscurity compared to James Cameron's other movies. Glad to hear the movie has another fan out there. It's funny because before I wrote the review I did some research looking into why the movie wasn't more famous and all the criticisms leveled at it seemed untrue or inadequate (for instance there were criticisms of the special effects which I quite liked myself). As always, thanks for commenting. It's good to hear there are others out there enjoying this film.